The representative of the alliance in the block of reform and reconstruction Hassan Aqoli, on Monday, the bloc of reform and reconstruction is the largest number of more than 180 deputies. 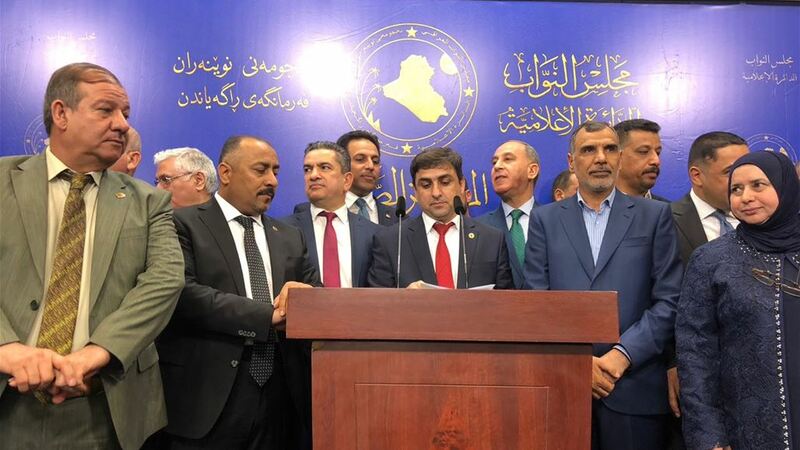 "After the quorum is completed today and the constituency is sworn in, the reform and reconstruction bloc has been formed by more than 180 deputies," said the head of a coalition of the bloc affiliated with the bloc, Hasan al-Akkoli, in a press conference held in the media department of the House of Representatives. "According to the Constitution, which stipulates that the President of the Republic to allocate the largest bloc to form a government, we formed our bloc and included the signatures of the heads of blocs belonging to the alliance," pointing out that "the bloc more than 20 political entity and going to form a strong government cross-sectarianism." A parliamentary source reported today, Monday, that the coalition building and nucleus announced during the first session of the House of Representatives that each is the largest bloc.